Special source study has always been a strong point of the Russian tradition of historical research, but in recent years it has lost its attractiveness in the eyes of historians. One should never forget that historical knowledge is derived primarily from historical sources that form the foundation of historical science. And it is extremely important not only to be aware about the time, place and circumstances of creating a document, its structure and features, but also to know what kind of life it lived during the centuries that separate the moment of his manufacturing from our time. What goals did it serve, what archival complexes did it belong to? 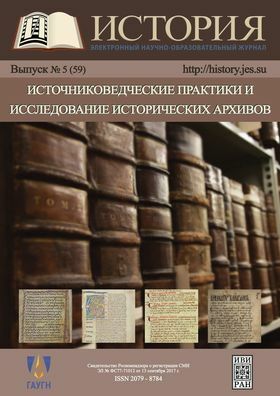 The articles of this issue are presented not only by the specialists of the Department of Special Historical Disciplines of the Institute of World History of the Russian Academy of Sciences, but also by colleagues from other research centers (Lomonosov Moscow State University, St. Petersburg Institute of History, Institute of History and Archeology (Ural Branch of the Russian Academy of Sciences), Higher School of Economics (St. Petersburg), research and publishing association “Aliance-Arheo”, the Russian State Library). The investigated materials belong to different cultures and periods (from England of the 11th century to Russia of the 18th century). But the focus of all these articles is a source study of a manuscript as a means of actualizing its informative possibilities in the context of the archival fate of the historical source.